Use old burned out light bulbs for this craft. Wash and dry, use acrylic paints, paint light bulb white, let dry about 25 minutes. Paint on face. While face is drying I crochet the hat for it out of yarn scraps, if you don't crochet you can use a baby sock, it is just as cute. 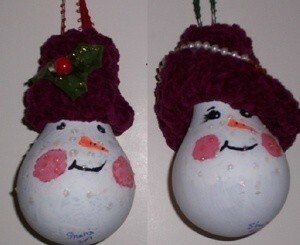 Hot glue hat on, hot glue ribbon or wire whatever you are going to use to hang it, hot glue decorations on the hat. I use clear glitter glue on the face to look like snow, these are so cute, I had to show people it was a light bulb, lol. Editor's Note: Use incandescent bulbs instead of compact fluorescent bulbs for this craft. CFL bulbs contain mercury and can be hazardous when broken. They should be appropriately recycled instead. The light in my apartment's stove hood blows out about every six weeks. Now I can use those blown bulbs for a Christmas gift. Thank you! im making some of these this year for Christmas gifts! !